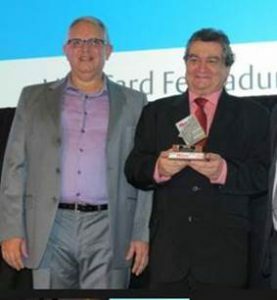 Global leader in hotel security technology receives respected industry award from Brazilian Magazine, Revista HOTÉIS, for its innovative line of electronic hotel door locks. Stockholm – April 4, 2017 – ASSA ABLOY Hospitality, the global leader in hospitality and hotel security technology, has been awarded the 2016 Vendor’s Trophy in the Hotel Industry for Best Locks Vendor. 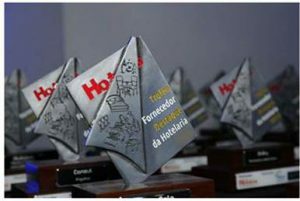 The annual ceremony, sponsored by renowned Brazilian magazine, Revista HOTÉIS, recognizes international vendors that show outstanding accomplishments in the supply of products and services in the hotel industry. This award marks ASSA ABLOY Hospitality’s second consecutive win in the category, having previously earned the Vendor’s Trophy title for Best Locks Vendor in 2015. Taking the lead over its competitors, ASSA ABLOY Hospitality was honored for its innovative VingCard electronic hotel door locks. These locks include the New VingCard Essence, that was recently released in Q4 of 2016, VingCard Allure, VingCard Signature RFID, VingCard Classic RFID and more. ASSA ABLOY Hospitality offers a wide range of locking systems and solutions that are RFID and Mobile Access compatible, along with many other highly advanced security and technological features, creating a wide range of innovative locking solutions that are specifically designed to fit today’s increasing industry demands for guest security and convenience.